Rustic Elegance is an awesome cabin nestled away atop the mountain with all the necessities for a romantic retreat or just the right size for a small family. We are far enough from town to enjoy peace and quiet yet close enough for restaurants and entertainment. 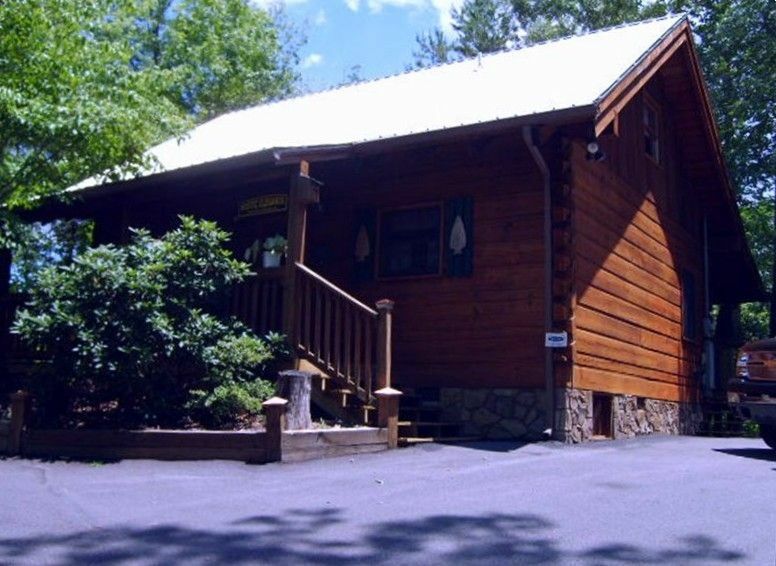 Cabin located 6 miles from heart of Pigeon Forge, 9 miles from the Wilderness Water Park and 10 miles from the heart of Gatlinburg - the Smokies are your playground! Cabin sleeps from one to four persons. Slide into the indoor jacuzzi tub for relaxing while watching the big screen TV or step out onto the very private and secluded deck for a dip in the hotub before retiring for the evening to the King Size Bed in the Master Suite. Please use directions given in reservation. GPS will not get you there! And Google maps are way off! Rustic Elegance is a true vacation rental by owner. We accept three night minimums, and monthly rentals. Please see the 'Links to More Information' section below for booking availability. Send me an inquiry - Owners are regular working folks looking to keep the mortgage paid - not a corporate property management company! Thanks! Hi Everybody - thank you for your interest in Rustic Elegance - we like many others bought the cabin as an investment for our future - then the economy went south - but we are hard working folks just trying to make ends meet and love to get away to the cabin for some peace and quiet away from it all! Hope you decide to stay with us and take some time to stop and smell the roses! We love the location of our cabin in that it is sooooooo convenient to both Pigeon Forge (just 6 miles straight down Dollywood Lane) and Gatlinburg (10 miles) - you can use the back roads of Teaster and Veterans Blvd to beat all the traffic to get back to the tranquility of the cabin yet be right in the mix within minutes! We love the woods surrounding cabin - the seclusion away from everybody and everything - it always feels like a special getaway just the two of us! The cabin is great for a couple or a small family - the hottub on the back porch is great to relax in while enjoying nature around you everywhere! Wooded in the spring and summer months. Two cars only. No trailers. We urge guests to bring beach towels for use with the Hottub and Jacuzzi tub! Cabin also has private picnic area complete with picnic table. Located on a private secluded back porch. Hottub outside and Jacuzzi tub inside! We definitely enjoyed our stay at the Rustic Elegance cabin! It was a GREAT little cabin, perfect for our family of 3. We could not get the jets to shut off on the hot tub, so I called and got it take care of right away! Great location .....we will DEFINITELY stay here again!! Great Cabin Secluded in the Mountains! This cabin is way off the beaten path - it is actually difficult to find the first time. There is one way in and one way out. The cabin's bed is very comfortable which is a rare find in a rental. The amenities are fairly limited (towels, pots, pans, utensils, etc.) but it was enough to get by. We have stayed here before so we knew to bring out own towels, blankets, and pillows. The cabin has no wifi which is bad if you don't have an unlimited data plan. Also the lighting in the cabin is not very good - it could definitely use more lamps/lights. The gas fireplace and hot tub are to die for though. Nothing better than sitting watching the fire in the evening. There is a small TV in the bedroom and living area. The TV in the living room has a big streak down the side, but it didn't interfere too much - just annoying seeing it. There were also several burned out lights - the outside lights were all burned out as were a couple of the interior lights. All in all - we really enjoy this cabin and will definitely come back again. Bit tricky to find but once there it was lovely. Just a little disappointed that the toilet constantly ran and not all the lights working. The indoor jetted tub was relaxing as was the hot tub outside, even in the cooler weather. After a little bit of a kerfuffle with the lock, we got in and immediately hit the sack. After a good night's sleep (the mattress is great) we were able to appreciate our cabin. We spent a great deal of time exploring so it was nice to have a cozy respite to return to. Also, this is the first time we have had good cookware in a rental. We didn't use it much but it's a bonus for families who will supplement their meals with home cooking. Restaurants are very expensive. After a walk or two through Gatlinburg we found the beauty of the Smokys surpassed anything that the strip could give us. The cabin is perfect for a couple. After a 12 hour ride today, I'm hitting the hay. If you are looking for a peaceful place to stay that's not far from town this is your place. Very affordable and great accommodations.